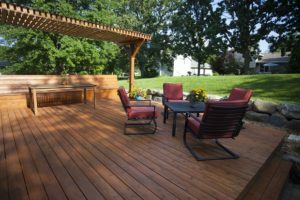 Adding a deck to your home is a great way to improve your home this year! A deck can add valuable living space to your home and give you a beautiful way to enjoy time outdoors with friends and family. Adding a deck to your home is a great way to improve your home this year! A deck can add valuable living space to your home and give you a beautiful way to enjoy time outdoors with friends and family. Additionally, if you have a growing family, a deck can be the perfect place for easy-to-clean playtime. If you choose a composite material for your deck, you eliminate many of the problems and risks associated with decks while gaining all of the benefits. Perhaps the most critical feature of a composite deck for small children is that they are a much safer option than wood. Over time, wood is prone to mold, rot, and decay. Spots that have damage may not always be easily visible, and the risk of injury to children can be high. Composite decks don’t have this issue as they can not rot. Additionally, they can’t splinter meaning there is less danger to little hands and feet. Kids have a lot of energy to burn, and it’s not always a great option to let them run around inside or in the yard. When you have a composite deck, it’s easy to let them get in some good hard play while keeping them constrained to a specific area. With a composite deck, you have more options for your balusters, which can help you choose the perfect blend of form and function. Your children will be free to run, play, and make as many messes as they can. With messes in mind, composite decking material is stain resistant. Unlike wood, it won’t absorb liquids or moisture and leave a tell-tale sign that a mess was made. Dry dirt can just be swept away, while more severe spills can be wiped up with soap and water. This feature will help keep your deck looking good as new for far longer. If you have a pool, a spill-prone toddler, or merely want to get outdoors after a rainstorm, some decking options can be slippery when wet. Composite materials have grooves and ridges to simulate a wood grain that helps to add a little traction in damp situations making it safer for anyone on your deck regardless of age.